We’d love your help. Let us know what’s wrong with this preview of Caldecott and Co. by Maurice Sendak. To ask other readers questions about Caldecott and Co., please sign up. Be the first to ask a question about Caldecott and Co. In elementary school it is traditional to bring cards on Valentine's Day. Most people come in with thin wisps of paper cookie-cutter-ed with his or her favorite character. It is a cute tradition, if not especially inspired. Most years I purchased my flat sentiment at the drugstore with everybody else. One year my mom put her foot down and said, "No!" She bustled me off to a craft store where we purchased paper-lace doilies, red tissue paper, and glue. We spent the weekend cutting the doilies into In elementary school it is traditional to bring cards on Valentine's Day. Most people come in with thin wisps of paper cookie-cutter-ed with his or her favorite character. It is a cute tradition, if not especially inspired. Most years I purchased my flat sentiment at the drugstore with everybody else. One year my mom put her foot down and said, "No!" She bustled me off to a craft store where we purchased paper-lace doilies, red tissue paper, and glue. We spent the weekend cutting the doilies into large heart-shapes, then gluing a red tissue-paper heart to the back creating a stained-glass Valentine of red and white. When I brought my homemade Valentines in, I was a little unsure: mine looked so very different than the others. I was eight. It is very hard at eight to recognize that different can be better. I didn't recognize immediately that my homemade Valentines shone with glee amidst the flutter of white uniformed rectangles. I was very popular that day. My friends loved the bright, beautiful color and lacy texture. Even the boys liked them (Wayne and John both gave me chocolate heart candies). It is one of the few times in my life that being different offered immediate, positive gratification. 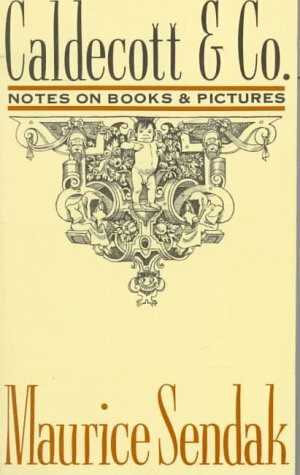 Music and illustration, Mother Goose, Hans Christian Anderson, Beatrix Potter, Walt Disney, Randolph Caldecott, his own work -- Maurice Sendak writes entertainingly and thoughtfully about illustration and children's literature in this wonderful collection of essays, interviews, speeches, and book reviews. As you would expect, he is especially good at identifying and celebrating emotional complexities in his own and others' work. I found this collection of Sendak's essays on the shelves at one of the libraries I visit regularly. It was so well hidden it wasn't even in the catalog anymore, so I definitely felt like I had uncovered a hidden treasure. Included in this book are Sendak's Caldecott acceptance speech, his reflections on the work of various authors and illustrators, his thoughts on Walt Disney, and thoughts on his own illustrations and the art of making books. I have always thought Sendak was an interesting man, I found this collection of Sendak's essays on the shelves at one of the libraries I visit regularly. It was so well hidden it wasn't even in the catalog anymore, so I definitely felt like I had uncovered a hidden treasure. Included in this book are Sendak's Caldecott acceptance speech, his reflections on the work of various authors and illustrators, his thoughts on Walt Disney, and thoughts on his own illustrations and the art of making books. I have always thought Sendak was an interesting man, and this book only deepens my appreciation for his intellect and his devotion to his work. This book was published in 1988, but it's amazing how much of what he says about the degradation of the picture book is related to discussions we have in 2013 about e-books and generally, about the difference between what kids like and respond to and what is supposedly "good" for them. Gonna write a "real" review, for a change. This is an anthology of his essays and musings on writing and illustrating for children. It reveals his formidable intelligence and his empathy with fellow toilers in what is too often regarded as a somewhat lesser field of endeavor. As if writing and drawing for children were a distinctly second-best fiction-writing. Sendak shows the degree of imagination, craft and humanity that goes into the best of this work. He is noticeably appreciative of well-kno Gonna write a "real" review, for a change. Sendak shows the degree of imagination, craft and humanity that goes into the best of this work. He is noticeably appreciative of well-known artists like Randolph Caldecott, Beatrix Potter and Jean de Brunhoff, and sharp-eyed essays on Andersen, the ``Mother Goose'' tradition and the best and worst of Walt Disney. I took a class with Maurice Sendak at the Parsons School of Design - and I have to say this book is at least as good as taking a class was. Maurice was a heartful genius - a person who never lost sight of the basic human dimension of being a vulnerable small being in a harsh world. The latter part of the book is especially awesome. It’s a shame it’s not in print anymore. Sendak was born in Brooklyn, New York, to Polish-Jewish immigrant parents, and decided to become an illustrator after viewing Wa Maurice Bernard Sendak was an American writer and illustrator of children's literature who is best known for his book Where the Wild Things Are, published in 1963. An elementary school (from kindergarten to grade five) in North Hollywood, California is named in his honor.